When we visited Italy last fall we visited several of our suppliers to see what we would be implementing into our chassis line for 2018. Upon a visit with Marco Parolin of Parolin racing kart we were introduced to the future of bodywork. I must say at first I was puzzled by what I was looking at when I first saw the front panel. It was very “different” looking to say the least. I couldn’t wrap my head around how it was the finished piece however I suppose times change and we progress forward and this was a good example of that. Marco explained how they had done significant wind tunnel testing and invested both a lot of time and money into this project in order to find every little detail imaginable to ensure they were not leaving anything on the table in regards to performance. While he explained the fluid dynamics results I was still thinking “how am I supposed to get on board with something this radical looking” and then he said the magic words, and to paraphrase “our competitor is rumoured to be coming out with something even more…radical?” so there it was, the future had been set and it was just a matter of time until everyone was using these aero tested kits. The Front panel is by far the biggest change over bodywork of the past. 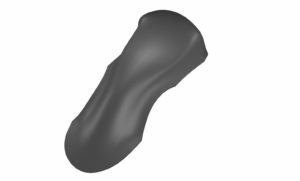 This piece was designed to funnel the air around the driver and reduce any drag created from the drivers upper torso and feet even. For those who are skeptical of what gains are actually to be had the research presented didn’t lie. You can see on the graphs how the drag reduction has been greatly improved over past versions of bodywork. This would especially be valuable on high speed tracks with extended periods of time at full throttle. 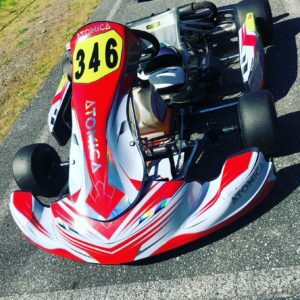 The Front Spoiler (nose cone) also is a big factor in the performance of the kart, and offers more than an aero advantage but strategic placement of the airflow coming through its passages. When looking at the front of the spoiler you can see a large centre portion which is designed to work in unison with the front panel as it directs the air up and away from the drivers body. To the sides of the centre portion are some channels which are strategically placed there to send a rush of air to the brakes, and the engine respectively. In tests using a competitors product it was noted that most of the air through similar channels were actually hitting the front tires and creating and unbalanced cooling of the tires. With the new Dynamica system this has been improved all while using the right materials to create the perfect rigidity to ensure we are not experiencing too much understeer which many spoilers are guilty of. In the end the summation is while it took some time for us to get used to the new look, it was inevitable that this would be the way karting was headed and now it has become an advantage we are happy to have. We are also pleased with the way the bodywork is looking with our sticker kit on the track especially when it is crossing the line first! 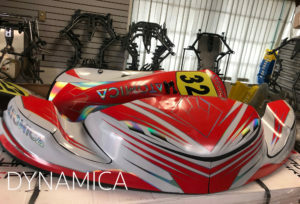 This entry was posted in Technical Articles and tagged aero, aerodynamic, bodywork, dynamica, Eurostar, fluid dynamics, Kart, karting, nose cone, parolin, spoiler, wind tunnel.